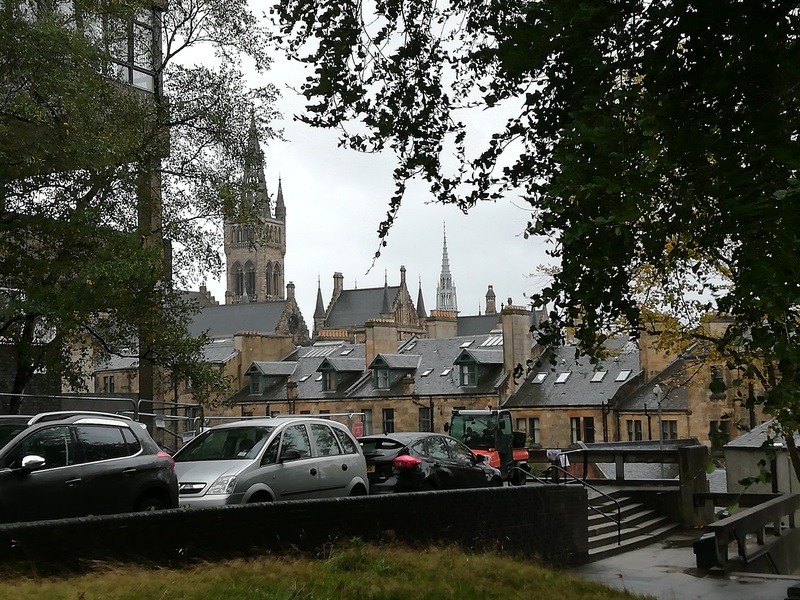 So, it has been almost a month since I have arrived at Scotland. As the plane was descending into Glasgow, the most beautiful landscape appeared out of the tiny airplane window. There were mountains covered in lush green trees with crystal blue lochs in the valley. Fun fact: there is only one lake in Scotland, but there are over 31,000 lochs. An immediate difference that I noticed is the language. Yes, American and Scottish people both speak English with different accents, but I did not realize just how different Glaswegian (the Scots dialect that is spoken in Glasgow). The first time a native Glaswegian spoke to me, I truly could not understand a word he was speaking. It sounded like a completely different language. When they speak, they drop so many letters in the words and use so much slang to the point where I just stand there and nod pretending I understand the conversation. Even now, I can only understand a few words that they are speaking and most of the meaning is lost to me. Hopefully by the end of the semester, I will be able to understand Glaswegian better. I’m currently living in a 12 person flat in student accommodations. At least in the U.S., the word “flat” is considered the same thing as an “apartment”. And when most people hear the word “apartment”, they image a housing accommodation with a few bedrooms, bathrooms, kitchen, and living space at minimum. When I first arrived at my flat after a long airplane flight, I was shocked to discover that the “flat” was simply a typical dorm with an additional kitchen. There is a long hallway with 12 single bedrooms and then a kitchen in the middle. Unfortunately, due to being “fire hazard”, we are unable to put in additional furniture. There is a good mix of international students in our flat: 3 from Australia, 1 from New Zealand, 1 from Quebec, Canada, 1 from Azerbaijan, and the rest from the U.S.
Uni has been an interesting experience. The first week was a hectic adventure trying to get classes approved and finding classes. 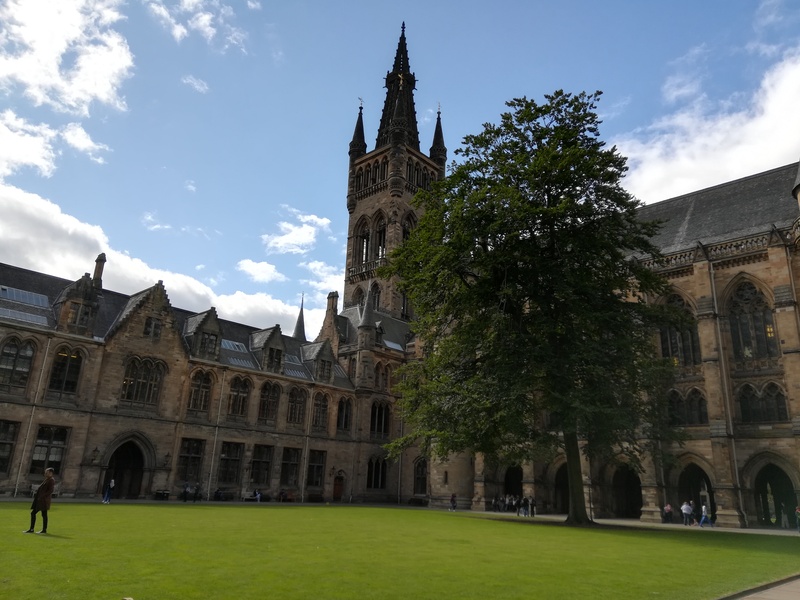 Unlike in the U.S. where classes are at a set time and location usually either on a Monday, Wednesday, Friday schedule or a Tuesday, Thursday schedule, at the University of Glasgow, class times and location change on a daily and weekly basis. For example, my Gaelic class meets in a museum one day and then in the medical school another day. And for other classes, we may meet in the mornings on some days, but on other days we meet in the afternoons. I had the hardest time finding classes that didn’t have time conflicts with each other. This is most likely due to the fact that there isn’t really a general education requirement here and non-exchange students typically only take courses for their major. 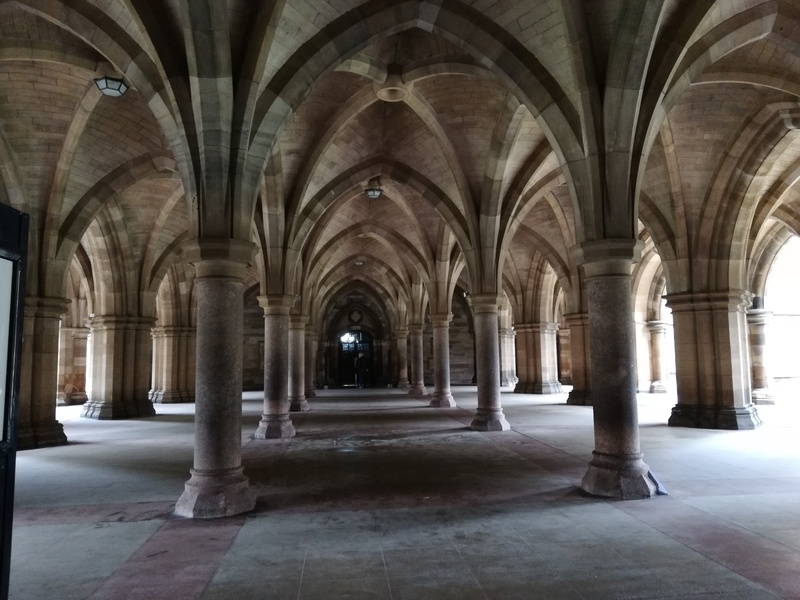 There is a greater emphasis on self-learning here than in the U.S. Back at my home university, there would typically be homework due daily or weekly, but at Glasgow for most of my classes there is just two term papers due and a long list of “suggested reading” to do on our own time. This week was Italy week at OU. As one of the many students who studied abroad in Arezzo, Italy, I love that this week brings Arezzo alum together, which brings back many fun memories of my semester there. While I love all of the free food I got to eat during this week-long celebration of Italy, my favorite event was the Lizzie McGuire movie. I vividly remember some of the people in my program getting together on our first weekend there and watching this movie (and then when we went to Rome a couple weeks later we watched it again). Some of my best memories from college were during my semester abroad, so I love when I get the chance to discuss and reminisce my experiences while eating delicious Italian food. Bonjour from Limoges! I left home on August 24th, so I’ve been in Europe for just short of a month. Before coming to France, I spent a week traveling with my best friend (another Global Engagement Fellow! ), Hennessey. We flew into Amsterdam together and made the best of four rainy days eating lots of good food and going museum hopping. During a brief period of sunshine, we rented bikes and rode around the canals, an experience that left Henn with a sizeable thigh bruise from a minor collision. From Amsterdam, we took a train to Brussels, where we stayed in a very cheap (and highly flawed) AirBnB. On our first night out, we were surprised to find that almost no restaurants served food on weeknights. When I went into one establishment and asked if they were serving dinner, the host said yes, “but no food, only beer.” Our few days in Brussels were marked by many struggles with finding food and using public transportation. We never ate dinner before 9 pm, and I was averaging about 20,000 steps a day. Still, we saw some wonderful things, including the Palais du Justice, which made Hennessey cry, and the Royal Museums of art. The highlight of our time in Belgium was a day trip to Bruges, a city that seems to just be famous for being cute. We spent most of the day wandering the streets, looking at the beautiful architecture and eating chocolate. The weather was perfect, and I think I’ll remember the day forever. After that, Hennessey and I went our separate ways– I got a train to Germany to visit some relatives, and she boarded a plane to Amaan, Jordan, where she is studying for the semester. 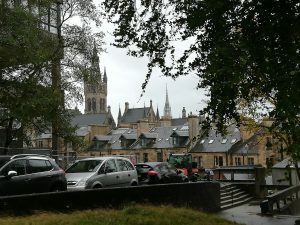 I spent three lovely days with my Aunts Marita and Marlies and Uncle Werner in Aachen. We had only met once previously, but I could tell that we were family. My Aunt Marita reminds me so much of my mom, and we even look alike (rosy cheeks run in the family!). Finally, I took a 15 hour bus ride from Aachen to Limoges, where I arrived on September 4th. The first couple weeks have been both more difficult and happier than I expected them to be, but I think this is the start of a wonderful semester! This summer, I was fortunate enough to be able to do a lot of traveling. In May, I visited New York City, Toronto, and Montreal for two weeks with a friend I’ve known since middle school, as well as friends who were exchange students at OU. Before leaving, I was interested to see how it would go, if we would make good travel buddies or if there might be some conflict. I was actually surprised how little trouble we had; although we did some things all together, at other times we naturally split up into smaller groups when we wanted to see different things. It was such a fun trip, and it was definitely interesting to compare the three cities as we went to one after another. New York and Toronto were both cities full of exciting things to do, see, and of course eat, as well as people from all different places and walks of life. However, Toronto kind of felt like the younger, cleaner version of New York, with nicer people. Although New York has a certain magic about it with its grittiness and history, I couldn’t help but think Toronto would be a nicer place to live if I had to choose. Nevertheless, both had their own charms and I definitely hope I can return someday (hopefully sooner rather than later) to explore them even more. You could certainly live in both cities for your entire life and still discover new things to see and do. I would also love to go back to Montreal one day. Entering the old part of the city was like stepping into a small piece of Europe, albeit a rather touristy piece. The rest of the city felt like a regular large North American city, which is not a bad thing. With a thriving young and hip community, there were many roads covered in beautiful street art and full of attractive coffeeshops and restaurants. From June to July, I traveled to Vilnius, Lithuania to visit my friend Migle who was my roommate during my study abroad in South Korea. I stayed with Migle and her family for a month, and there’s no way I could possibly write about all of the things we did. Not only did we explore Lithuania’s capital Vilnius, we also went to the seaside and stayed in a yacht at the Curonian Spit, which separates the Curonian Lagoon from the Baltic sea. We visited the small town my ancestors came from, Moletai, and we traveled across the border to visit Riga and Tallinn, the capitals of Latvia and Estonia. I went at the perfect time, because I was able to experience both the Midsummer’s Festival/St. Jonas’ Day and the Lithuania Song and Dance Festival. The latter would normally not have occurred this year, but was held specially for the Lithuanian Independence 100 Year Anniversary. Traveling with a local is such a rewarding experience, because you see and do things that you would just not even know to look for if you are touring by yourself. Migle and I also traveled together in Korea, so we already knew we made excellent travel partners because we are interested in seeing the same kind of things. We visited pretty coffeeshops ranging from sleek industrial styles to “soviet chic” style, we explored traditional open-air markets as well as modern shopping malls. Staying at a local’s house and getting to eat home-cooked food is also a luxury when you are traveling, especially when your friend’s mom is such an excellent cook–I know from personal experience. As much as I loved studying abroad in Korea, not having access to a kitchen or home-cooked food 99% of the time could get tiring. I may write another post later to discuss more about some aspects of my travel in Lithuania, because there is just so much to write. In Toronto, Montreal, and Vilnius, there was a certain aspect that gave me a strange feeling as a Jewish person. Both of the cities had thriving Jewish communities in the not-so-distant past. Vilnius in particular used to be called the Jerusalem of the North or the Jerusalem of Lithuania because its Jewish population was so large before World War II. Right before World War II, Jews accounted for 30% of Vilnius’s population. Following World War II, the Lithuanian Jewish population was nearly decimated. Very few Jews now live there, and the Great Synagogue there has been replaced by an elementary school that my friend attended because it was a five minute walk from her home (although the school is now closed, as well.) I took a “Jewish Vilnius” walking tour and while fascinating, it was also saddening to realize that a huge, thriving community that used to live right in and around my friend’s neighborhood had been essentially destroyed. Montreal and Toronto’s Jewish communities are doing much better than Vilnius’s, but it was strange to realize that the artsy, hipster areas that my friends and I were having fun exploring used to be the Jewish neighborhood of the city. Although I loved the existing atmosphere of those areas, I couldn’t help but feel a little remorseful that much of the Jewish culture in those areas were lost. I wondered what it would have been like to visit when those neighborhoods were still home to a large Jewish community. I was, however, also inspired by signs of efforts to celebrate the Jewish community, such as the Shalom Montreal exhibit at the McCord Museum, or efforts to restore and respect the memory of the Jewish community, such as the current excavations of the yard of the Great Synagogue of Vilnius. Of course in New York City as well there is a huge Jewish population, but during my trip my most significant encounter with Jewish New Yorker culture was eating at the very touristy, very overpriced Katz’s Deli. Hopefully next time I go to New York I can explore the Jewish culture there more fully. This semester, my OU Cousin is a lovely girl named Seunghye. Although we never got the chance to meet while I was there, she is from Kyungpook National University, the school at which I studied abroad in Daegu, South Korea from 2016 to 2017. We got in touch through a mutual friend from KNU when Seunghye came to study at OU. Seunghye has a very bright personality and it was very easy to get close to her, even though I can be a bit shy when I first meet people. We talk together in both English and Korean so we can both practice our language skills, although Seunghye is so good at English it doesn’t seem like she needs much practice. On Saturday, I went with Seunghye and some other exchange students from KNU to the State Fair. To be honest, it was not as exciting as I remembered it being when I was younger. I have very fond memories of going to the State Fair with my friends in middle school and high school, eating the heart attack-inducing fried food and riding the rides. I guess after I got a bit older and realized how dangerous the rides were (since they made to be broken down and put back together frequently), some of the magic of the fair disappeared. Nevertheless, it is still fun to take exchange students to the fair so they can get a piece of American and Oklahoman culture. Even though we didn’t ride the rides, the atmosphere was quite exciting and the food was…well, it’s unique. Many of the foods they sell there you can’t get anywhere else. We tried the fried oreos and the Indian taco. We also tried several samples of locally-made products, such as wine, coffee, and candy. We also did some people-watching and talked about the Oklahoman accent and Southern dialect of American English, since many fair-goers had Oklahoman accents. Even though it was quite hot, it was still fun since we were there together. On September 6th, I attended a conversation and group discussion with Dr. Gershon Lewental about the present state of the Arab-Israeli Conflict and its future. In the past, I have taken a course with Dr. Lewental about Israeli culture and film that I thoroughly enjoyed. I have not been able to take one of his classes since then, so I wanted to attend this event to hear from him. In addition, as a Jewish person I always feel like I should be more educated about the Arab-Israeli conflict than I am. Despite having learned about it multiple times, because of its complexity the details quickly get fuzzy. I also went to this event to educate myself more about this issue. An interesting point that Dr. Lewental made about the current state of the conflict is that the biggest change in recent years did not actually occur in Israel or Palestine. The biggest change was the establishment of the Trump administration in the U.S. Like with many other issues, Donald Trump’s rash and uneducated statements and actions, such as his decision to move the U.S. embassy from Tel Aviv to Jerusalem, have led to unfortunate consequences in Israel. His decision to move the U.S. embassy gives the impression that Jerusalem is a part of the Jewish state and only the Jewish state, which is a conflict-creating move given Jerusalem’s importance to all three of the Abrahamic religions. Trump has given the more extreme members of Israel’s right wing party, which is currently in power, a sense of security. This means that the right wind party is shifting further away from the center. In July, Israel enacted the “nation-state bill”, which while in reality does nothing, has a significant symbolic meaning. The bill says that Israel is a Zionist state of the Jewish people, which was obviously already the case, but it does not emphasize protections or equality for minorities. The rhetoric effect of this bill is that it provides support for the political far-right, and demotes Arab minorities in Israel as a group. This has resulted in protest rallies among the Druze and Arab Muslims. The Druze were the first to file a petition with the court against the law because they saw it as an attack on them and their ethnic bond with the Jews. With these events that have had a negative effect on the Arab-Israeli conflict in mind, Dr. Lewental stressed the necessity for both Israeli and Palestinian politicians to be more proactive about improving relations. The problem, he explained, was that it is beneficial for these politicians to maintain the status quo instead of pushing for peace. Israeli Prime Minister Netanyahu does not subscribe to a particular ideology; rather, he does what is necessary to maintain support so he can stay in power. Right now, this means pandering to the far right. Mahmoud Abbas, president of the Palestinian state and the Palestinian National Authority, also wants to retain his office, so he has been undermining any potential successor. He has been in power for much longer than he was supposed to be, so his death will likely lead to internal conflict in Palestine over who will replace him. The situation is essentially at a standstill as both of these politicians simply try to do what is necessary to maintain their own personal power, instead of considering what is best for their people. Dr. Lewental said that the political left in Israel need to find a more charismatic figure for their party and make more efforts to persuade the Israeli public that the country does in fact have a “partner for peace” in Palestine. Overall, the talk was fascinating but not exactly uplifting or hopeful. Although it is a complex subject about which I do not feel comfortable making any predictions, I hope that in the future politicians on both sides of the conflict will be more enthusiastic about coming to a compromise and a solution.